2017 Topps Now Doctor Who enters the on-demand universe! Following the customary Now formula, Doctor Who collectors are able to purchase print-to-order cards within the 24-hour selling window via Topps.com. The inaugural set begins with massive news as BBC announced the Thirteenth Doctor will be female and portrayed by Jodie Whittaker (Broadchurch). 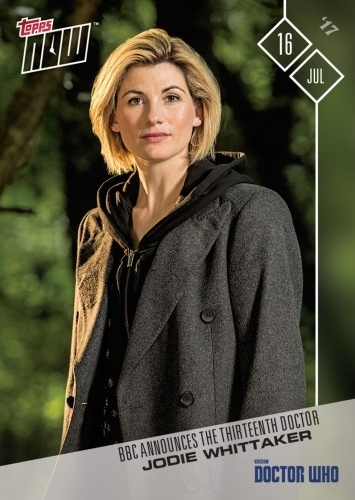 Fittingly, this is the first real-time Doctor Who set while Whittaker is the first-ever female Doctor. Traditionally, the cards are released either following an event or episode, however, no official announcement has been made for future releases. Final print runs are revealed after the selling period closes so collectors know the exact rarity for every card. Be sure to check back as the 2017 Topps Now Doctor Who guide will be updated with new cards and details. If you are looking for more choices, the popular sci-fi series already has several traditional card sets from Topps that collectors can explore. 2017 TOPPS NOW JODIE WHITTAKER #1 • PSA 10 • DOCTOR WHO • 13th DR FIRST CARD! Release date noted below. Set print runs (PR) are listed when known. Buy available Now Doctor Who cards through Topps.